On the hunt for that new scope, huh? We are going to help you find the absolute best scope for a .223 bolt action rifle. It can be overwhelming pouring through the infinite amount of scopes and different features that are made available with them. Even trying to get someone’s opinion on what you should buy can be an endless conversation. That’s why we’ve broken them down into 5 easy options for you and we’ll give you a little something about each one that will help you find the right scope for what you’re shooting for. What And Where’s Your Target? The very first thing to consider before purchasing a scope, or even looking for one, is how you’re going to use the .223 caliber bolt action rifle in the first place. Perhaps you’re using it for varmints? Or target practice? The trajectory is good enough on a .223 you can even be building your skill on longer range paper targets. It doesn’t really have enough power for humane hunting at long range though, even with a scope. There are also some hunters that use the heavier grain of the .223 bullets to hunt deer with. I would recommend keeping the deer under 150 yards to ensure you have enough velocity from the shot to kill the deer humanely. Getting over 200, 300 yards on deer or even varmints with this rifle can be inhumane. This is because the velocity of the bullet is too slow to be doing enough damage to be a humane kill, even if you do manage to kill the animal. You’d also want to check up on your local laws to ensure it’s legal in your state to hunt deer with this caliber. The grain of your bullet just refers to the mass of your bullet. A heavier bullet will go farther faster and for a longer time. Just for your reference most varmint hunters will use a 35-50 grain bullet and jump up to a 65+ grain bullet for big game hunting. It’s also good to mention the twist rate of your rifle. If you’re shooting lighter bullets, which you would be for targets and varmints, you’d want to use .223 rifle that’s using a “slow twist rate”. People report success with 55-grain bullets at a 1:9 twist rate but anything lighter than 55 grains start to fly everywhere and you lose accuracy on the shot. The reticle on the .223 gets a lot of help when you find a reticle with bullet drop and wind compensators built in. The BDC reticle (bullet drop compensator) combined with low magnification is super popular on scopes in this caliber for hunting so you don’t risk having your elevation or windage dialed incorrectly when it is time to take the shot. Again it’s going to depend on what you’re doing. If you want a versatile do-it-all kind of magnification you’d be looking in 2x-10x or 4x-12x ranges. Having the low magnification combined with the BDC reticle is going to get you awesome results, on the first focal plane. Just so you know, the BDC will only work on the low magnification with most scopes if they’re designed in the First Focal Plane (FFP). In your scope, there is a first focal plane and second focal plane design options. Second focal plane (SFP) will keep the reticle the same size as you zoom in and out. This means the other hash marks on the BDC reticle won’t adjust for the lower magnification settings which means they aren’t going to be useful unless you’re on the maximum setting. If you’re using the .223 for long range target practice this won’t be an issue because you will just be on max magnification all day and can use the hash marks all day! The focal plane and magnification are both key considerations though if you want to be able to shoot those varmints at 200 to 300 yards without playing with the elevation and windage turrets. It’s important to consider the scope itself and how it’s made when you’re purchasing one. You have probably heard that you should spend on your scope how much you spend on your rifle. Well if you’re buying a “second gun” its good to know that it’s durable, provides a clear image through the sight, and also has a good light transmission. The top scopes are made with airplane-grade aluminum for strong durability and we’ll go into the details on each scope we review for you. Scopes, and actually all optics, are standardly coated with a coating (usually magnesium fluorite) onto all lenses with multi-coating meaning at least one lens has multiple coatings on it. The coating is to help reduce the glare and reflection of the light so that the transmission light is solid and you get a good view through the scope. Obviously, the quality of glass will determine if you get a good image through the scope and this quality usually varies by what you spend on the scope. Weight isn’t the end all be all of a scope feature but it’s important to mention in case you don’t think about it. Considering a .8 lb scope vs a 2 lb scope can make a difference if you’re trekking through the mountains with it. The Sightmark Core comes in at a solid 2 pounds and is heavier than some other similar models but customers are stating that the clarity of the image is great when compared to scopes that are twice the price. It’s also got a lifetime, no questions asked warranty which is awesome. It’s got a magnification range of 2.5x-10x where the 2.5x is still reported to work well on close range and 10x will still give you the ability to still stretch your legs on those long ranges. The BDC reticle is specifically calibrated for the .223 caliber so it will work great with your bolt action rifle. It comes with adjustable turrets so you can adjust the turrets manually. This is quite useful because the scope is in the second focal plane which would mean you’d have to be in the max magnification of 10x to use the BDC. If you use the elevation and windage turrets to adjust for the shot you can remove the hex screws and pop up the elevation turrets and spin them back to zero! This way you won’t affect the scope sighting you worked so hard on. Related Read: Bolt Action Rifle Scopes. The Primary Arms Orion Riflescope comes in at 1.5 pounds with the ACSS Reticle which gives you both the hash marks for elevation and windage. The kicker? It’s also in first focal plane so no matter what magnification you use it at, 4-14x, it will hold it’s reticle proportions. 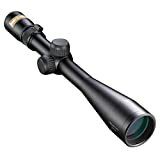 This scope is a great option for the .223 bolt action rifle because it’s not only calibrated for this rifle but because of these features its great for varmints and deer at close to mid range and also for those long-range shots during target practice going up to the maximum 14x magnification setting. It comes with capped turrets to adjust for wind and elevation manually if you need it, but it’ll be rare if you’re using the pre-installed reticle, which is why they come capped. Capped just means you’ll need a flat head screwdriver or even a penny to make adjustments. Precise .25" @ 50 yard adjustments. The Nikon Prostaff Rimfire Scope comes rolling in with 4-12x variable magnification. Customers state that the magnification has great focus and clarity from the 4x magnification all the way through to the 12x setting. The scope itself comes in at about 1.3 pounds and for those concerned about weight can note it’s on the lighter end. It’s got the BDC reticle to compensate for bullet drop without getting yourself lost on the turrets. If you need to adjust for windage though, or bullet drop, both the turrets are spring loaded and easy to pull up and set back to your zero when you’ve landed the shot. The reticle comes in handy for those long shots and has the magnification to boot. This scope is parallax free at 50 yards which means you shouldn’t need any adjustments at this range. It’s worth to note that people are using this scope generally for 50-150 yard ranges. The BDC comes in handy for the longer ranges but it might be tough to push this one passed 200 yards if you’re looking for long-range competitive shooting scope. The optics come with the standard multi-coating for anti-glare/reflection and is waterproof and fog proof. Customers state that the optics provide a great image and quality of picture for the price. The Nikon P-223 is engineered specifically around the .223 cartridge with a 55-grain polymer bullet and has the BDC 600 reticle which provides hash marks to compensate for yardage from 100 to 600. It’s got a quick focus eyepiece that brings the picture into focus quickly regardless of which magnification you’re on which ranges from 4-12x. This scope is going to be awesome for varmint hunting. You might want a heavier grain bullet than 55 if you’re thinking about hunting deer. Nikon has a program for Spot On Ballistic Match technology which is an application you can get on your phone to match your specific scope and bullets to really unlock the accuracy potential of your gun. It’s not necessary that you use it, but now you know it’s there. Even though it’s calibrated for the 55-grain bullet .223 cartridge using this application will help you utilize other bullets and see how they work with the scope without even pulling the trigger! The weight rolls in at 1.1 pounds and it’s included with fast action adjustable turrets to make adjustments to your shot on the fly without losing the original zero of your scope. People are reporting they are hitting shots at 600 yards just by purely using the dials on the scope and nothing else. Other people are reporting that it’s holding it’s zero even after hundreds of rounds. This beast of a scope comes in at 2.15 pounds, weighing near the heavy end. It’s rocking the second focal plane design which means the reticle is going to stay the same size regardless of magnification. This means using it on anything other than the highest magnification will make the Dead-Hold BDC reticle disproportionate to the shot, so keep that in mind. It does have knobs on the scope so you can manually adjust for parallax at varying ranges so you don’t have to rely on the reticle if you aren’t at max magnification. The magnification itself runs in a range from 4-12x with 12x being the max. The knobs to adjust are capped so you’ll need a tool to reset them to zero but customers are reporting that the scope tracks back to zero super easily. It zeros in nicely, holds the zero well and gives a good, quality image of the target all while covered under Vortex no BS warranty. All of this and it comes in with a single piece of aluminum that has multi-coated optics and is also waterproof, fog proof, and shockproof. Most customers are reported using this scope for varmint hunting and it can also be used for tactical, range shooting. For the price, it’s a great do-it-all riflescope. Now you got what you need. Or at least the information to know which scope is the best scope for .223 bolt action rifle. Most people use a .223 on varmints in and under 300 yards and some are hunting deer under 200 yards. If you’re on the target range, remember the trajectory of the .223 in a bolt action is good enough to play at that so you can settle for the second focal plane scope on max magnification. Now that you’ve leveled up on your scope knowledge, go get what you need!